First Chemical Limited is a cleaning product company in Toronto, Ontario, that provides a variety of top-quality chemical products and equipment to meet the sanitation needs of commercial businesses. Whether we are keeping your kitchens clean or your customers out of harm's way, we are capable of performing a variety of output tasks to supply the quality detergents, soaps, rinses, and sanitizers you need in your business. The production process starts in our pilot plant and advances through our full-scale production house. Our capabilities include a wide selection of reaction possibilities and operating conditions to create the finest soaps in the industry. 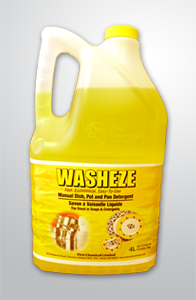 Our typical unit operations include powder and liquid products for kitchenware washing and laundry. 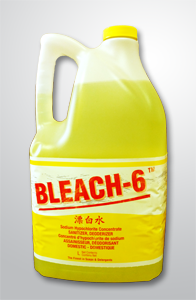 This Bleach-6 is ideal for your sanitizing needs, so that you can eliminate the increase of germs. 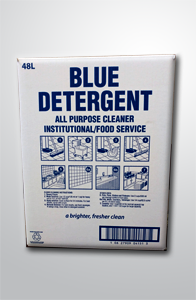 Blue Detergent is a premium high sudsing manual pot and pan detergent formulated to be very mild on the hands. 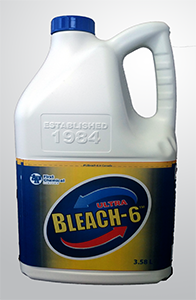 This is another effective utra bleach that gives you the ability to choose which product works best for your business. Contact us if you Would like to know more about our cleaning solutions or pricing. Cleaning a business or workplace can be daunting if you do not have the right materials at hand. There are high levels of traffic which spread dirt and grime, there are products which get used and contaminate the area, and there are germs and bacteria to eliminate. To meet these challenges, you have to rely on effective commercial cleaning products in Toronto, ON. At First Chemical Limited, we have a range of products that stand up to all the issues that confront cleaning staff on a daily basis. Restaurants, cafes, diners, and bistros all exist in a very competitive market. The slightest difference can set one above the other and go a long way toward their popularity. Give your establishment an edge in meal presentation by making use of our dishwashing products for spotless glassware, cutlery, and dishes. There’s a wide range of areas in every commercial property that require specialized cleaning products. Some spaces are high-contact areas that need to be hygienic to prevent the spread of germs, while others are coated with heavy dirt that has to be lifted with industrial- strength products. The sanitation items we offer are ready to handle whatever you can throw at them. Contact us to get the cleaning products you need for your business. We proudly serve the Greater Toronto area.